Программный комплекс XPAC предназначен для календарного горного планирования и прогнозирования развития горных работ. XPAC разработан австралийской компанией Runge мировым лидером в разработке решений и предоставлению услуг для горнодобывающих компаний. 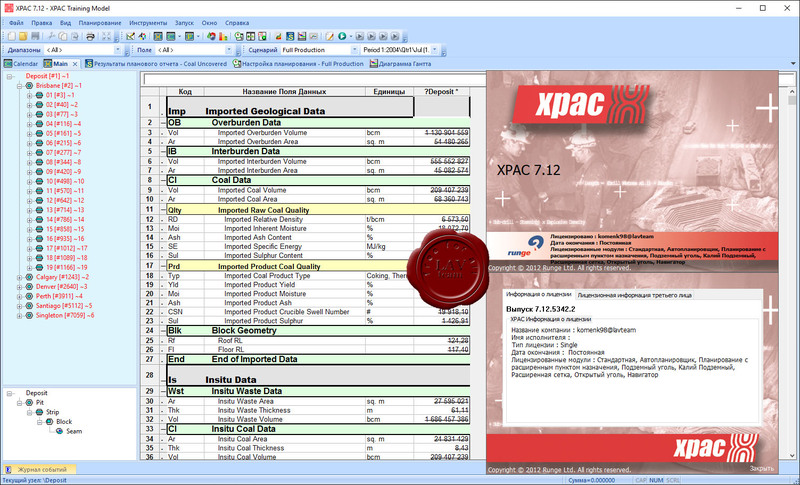 XPAC is RPM’s industry-leading software solution boasting unrivalled scheduling capabilities. With over 30 years of delivering practical schedules that add real value to mining operations, XPAC is the industry’s go-to for mine scheduling across the globe. Empowering users to model reserves, generate production schedules and evaluation best practice scenarios, XPAC delivers unmeasurable value to mining engineers. Программный комплекс OLGA разработан для моделирования установившихся и переходных многофазных потоков в скважинах и трубопроводах. OLGA может работать с любым сочетанием многокомпонентных углеводородов и пластовой воды, а также с однофазным потоком. Точнее, программный комплекс OLGA используется для эффективного и точного моделирования, анализа и оптимизации значительного набора операций по транспортировке скважинной продукции и связанных с ней явлений, то есть применим для широкого ряда операций системы. Successful production system design and operations requires a detailed understanding of multiphase flow behavior. Flow modeling and simulation provides valuable insights into flow behavior, including the physics describing flow through the entire production systems, from reservoir pore to process facility. The OLGA dynamic multiphase flow simulator models time-dependent behaviors, or transient flow, to maximize production potential. Transient modeling is an essential component for feasibility studies and field development design. Dynamic simulation is essential in deepwater and is used extensively in both offshore and onshore developments to investigate transient behavior in pipelines and wellbores. 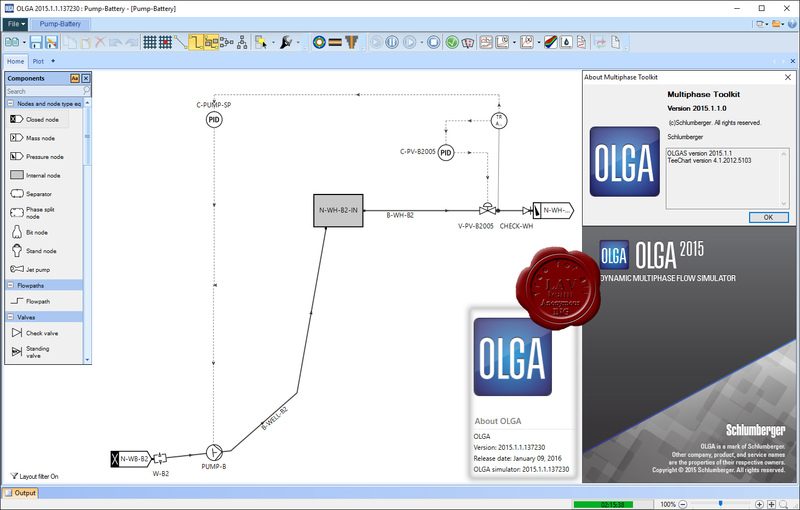 Transient simulation with the OLGA simulator provides an added dimension to steady-state analyses by predicting system dynamics such as time-varying changes in flow rates, fluid compositions, temperature, solids deposition and operational changes. From wellbore dynamics for any well completion to pipeline systems with all types of process equipment, the OLGA simulator provides an accurate prediction of key operational conditions involving transient flow. Компания R-Tools Technology Inc. является ведущим разработчиком многофункционального программного обеспечения по восстановлению данных, файлов, резервному копированию, безопасности данных и конфиденциальности информации. R-Studio это группа утилит для восстановления диска. Первоначально предназначенная для специалистов в области восстановления информации, в дальнейшем R-Studio стала многофункциональным, удобным и универсальным инструментом для восстановления данных. Сочетая новейшие уникальные технологии восстановления файлов и диска с удобным пользовательским интерфейсом, R-Studio позволяет эффективно решать задачи как компаниям и частным лицам, занимающимся восстановлением данных, так и начинающим пользователям. Поддержка всех основных файловых систем, в том числе FAT12/16/32/exFAT, NTFS, NTFS5 (созданных или измененных в Windows 2000/XP/2003/Vista/2008/Win7), HFS/HFS+ (Macintosh), Little and Big Endian variants of UFS1/UFS2 (FreeBSD/OpenBSD/NetBSD/Solaris) и Ext2/Ext3/Ext4 FS (Linux). Восстановление данных с переформатированных и форматированных жестких дисков. Поиск файлов по сигнатурам (поиск при сканировании файлов известных типов ) с возможностью добавлять новые типы файлов пользователем. Просмотр содержания файлов; оценка шансов успешного восстановления диска до покупки лицензии. Гибкие возможности поиска файлов - позволяют эффективно восстановить файлы различных размеров. Резервное копирование и создание файлов-образов восстанавливаемых дисков (локально или по сети). Файлы-образы совместимы с файлами-образами R-Drive Image. Загрузочная версия R-Studio Emergency, позволяющая надежно и эффективно очистить дисковое пространство любого носителя (жесткие диски, флеш диски, внешние диски и т.д.) для дальнейшего использования или утилизации; работает даже на незагружающимся компьютере. Восстановление диска по локальной сети (LAN) или через Интернет. Профессиональный модуль реконструкции RAID, сопоставимый и превосходящий по своим возможностям программы, специально предназначенные для этих целей. 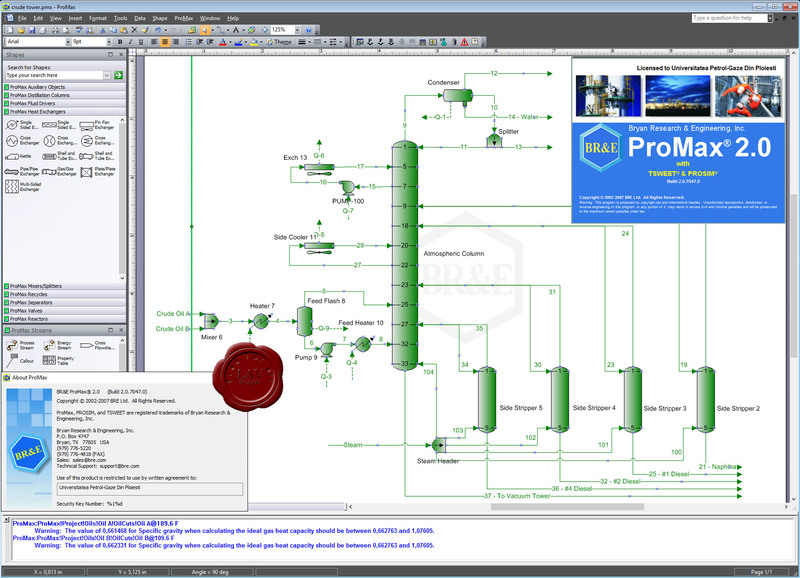 ProMax is a powerful and versatile stream based process simulation package. It is used by engineers around the world to design and optimize gas processing, refining, and chemical facilities. ProMax contains over 50 thermodynamic package combinations, over 2300 components, OLE Automation tie-ins, specifiers, solvers, crude oil characterization and Microsoft Excel spreadsheet embedding. ProMax offers all of this with amazing flexibility and ease of use. ProMax is built on technology proven over the past 30 years. Its predecessors, TSWEET and PROSIM, are widely recognized by the industry for their accuracy and efficiency. With ProMax, BR&E has continued to build on its reputation as a leading provider of simulation technology by focusing on several key processes. These processes include amine sweetening, glycol dehydration, equipment rating/sizing, crude oil refining, LPG/NGL recovery & fractionation as well as caustic treating. These processes are not the limit. ProMax is a uniquely extensible software package and may be customized to meet the needs of each individual client. ProMax was created by engineers for engineers. Because of this, ProMax is the "must have" simulation resource for engineers throughout the oil, gas and chemical industries. Its intuitive interface makes setting up even the most complex of flowsheets a relatively simple task. Tools are available to interact with Excel and other powerful programs to make ProMax a powerful and versatile tool. 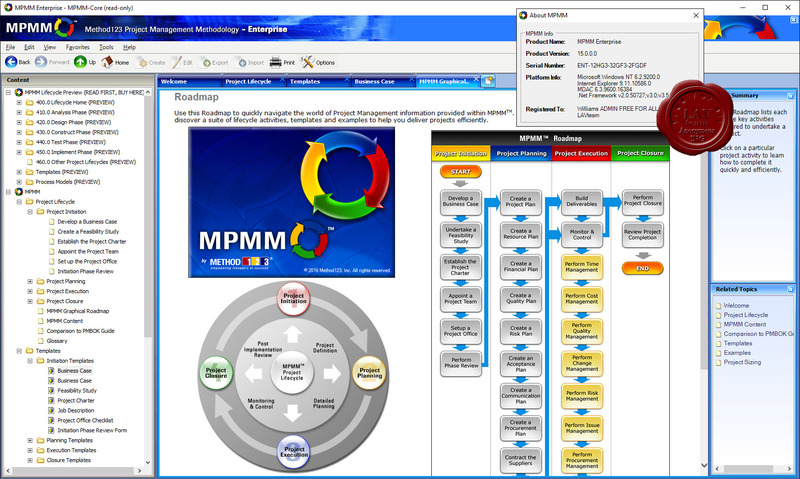 This Method123 Project Management Methodology (MPMM) helps you deliver projects. It sets out the entire Project Life Cycle step-by-step, so that your team can all use the same project management process for delivering projects. As well as including practical templates and examples, you can even create and import customized project management methodologies of your own. 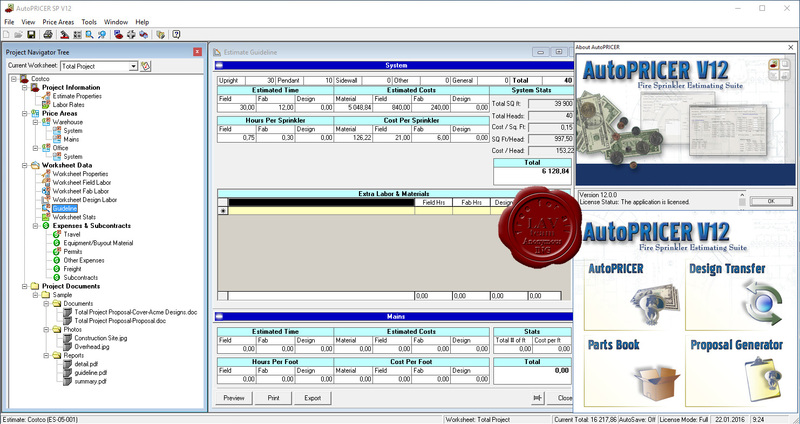 AutoSPRINK is stand-alone Fire Protection software for the Microsoft Windows family of operating systems. This powerful software from MEPCAD, Inc. signals a revolutionary approach to fire sprinkler systems. Based on a myriad of new concepts, ideas and composition methods, AutoSPRINK is causing designers to rethink the possibilities of fire sprinkler systems. ARES PRISM is integrated project lifecycle management solution that supports the planning, execution and completion of capital projects for dependable forecasts, cost control and performance measurement. Even negotiated projects need pricing and continued change order costing. 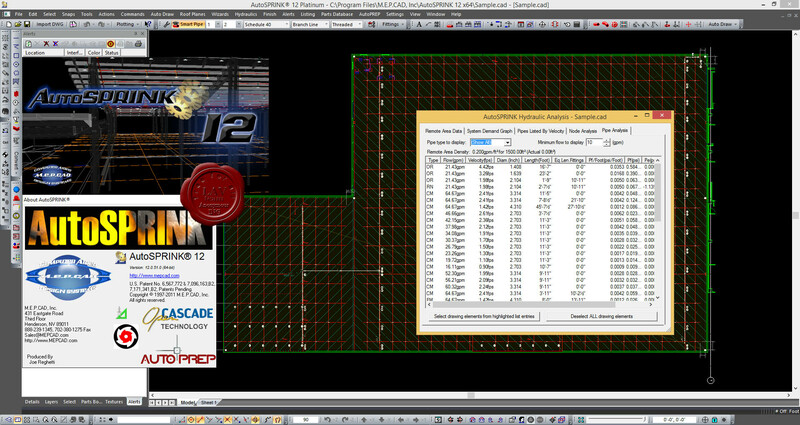 AutoPRICER is without a doubt the most incredible estimating software ever created for that purpose and much more. If I may say so, estimating and sales is my forte' and once you experience the elegant simplicity of this all encompassing program you will agree, it was built from the ground up by industry savvy leaders and not just programmers. Here again I don’t want to go into minute detail as you can explore the AutoPRICER program guide on our site but I do want to explain some of the time saving, error checking and management features of the program. As you would expect it will provide totally accurate and concise estimates from scratch or from AutoSPRINK drawings in just a fraction of the time with a minimum of input. 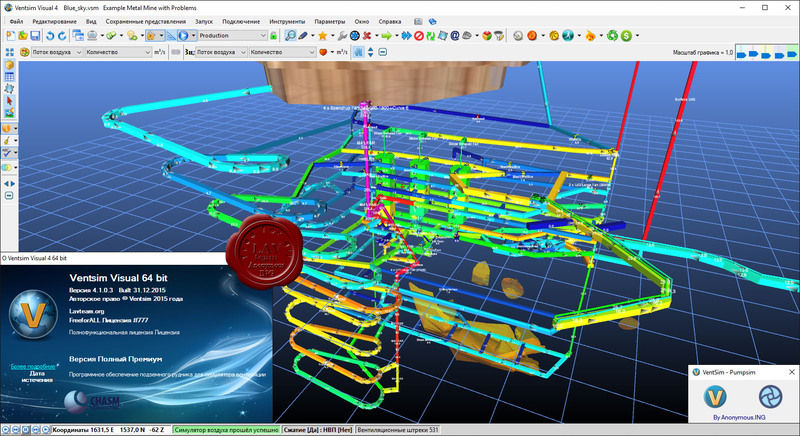 Because of the internal intelligence of system components, simple sketches and drag and drop pre established "kit assemblies” can be placed in an estimate drawing combined with automated commands to place fittings, couplings and supports to make simple work of estimating the most complex projects. The program also contains a built-in "Proposal Generator” that creates detailed "MS word” proposal documents, including design criteria by area, point and click qualifications, clarifications, inclusions and exclusions etc. It contains another feature called "Design Transfer” that keeps track of all relevant design information collected during the bidding process ready to hand over to the design department. Some of its features include, bid design specifications, pre-bid meeting notes from contractors, consultants, AHJ’s etc., value engineering ideas and possible change orders to pursue. If you have costing and accounting programs that assist with the clerical operations AutoPRICER has built-in communication systems that are compatible with most commercially available programs. You can also order AutoPRICER with a built-in simplified estimators specific version of AutoSPRINK to provide automated hydraulic calculations and the ability to easily compare differing designs to determine the most cost effective.